Bears aren't the only ones that hibernate during winter. When daylight hours are short, we tend to curl up on the couch with a glass of wine after work. By the time summer hits, we can't wait to leave our couch potato ways, and our weekends are filled with trips to the beach and barbecues with friends. 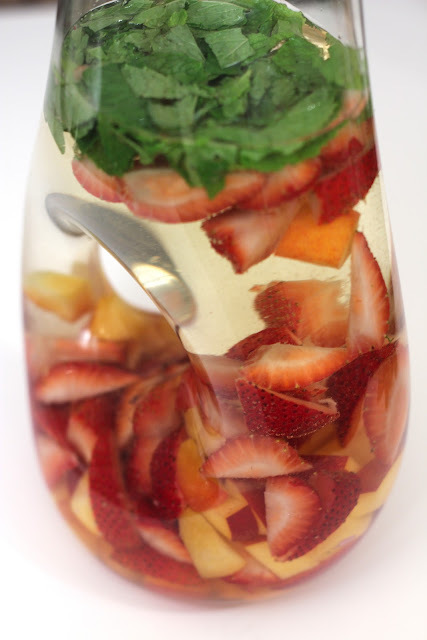 We love sangria for casual entertaining, as it can be pre-made, thus freeing up your time to enjoy with friends. You can customize sangria by adding in whatever fruit you'd like, but they should ideally be on the firmer side so they don't disintegrate. 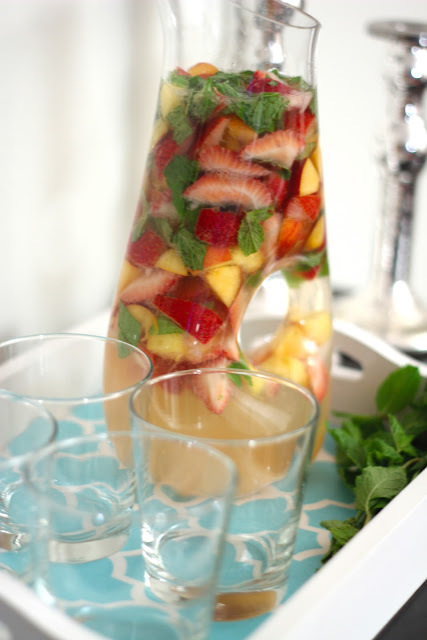 Some of our favorite fruits for sangria include peaches, strawberries, oranges, lime, apples, grapes, and pineapple. We recommend using an inexpensive wine that is mild in flavor like a pinot grigio or a sauvignon blanc. A word of caution: this drink is super duper tasty, and you can quickly down a glass or two. We learned this the hard way! Make simple syrup by mixing water and sugar in a microwave-safe bowl. Microwave until sugar is dissolved, approximately 1-1.5 minutes. Place in refrigerator to cool. Dice strawberries and peaches into 1/2 inch pieces and place into pitcher. Coarsely chop mint leaves and add to fruit. Pour in triple sec and wine and stir gently to mix all of the ingredients. Chill mixture in refrigerator for at least 1 hour and up to overnight. When ready to serve, mix in simple syrup to your desired sweetness (we added 1/3 cup). Then top off with sparkling water (optional). Make sure each glass gets some fruit, as this is the tastiest part! 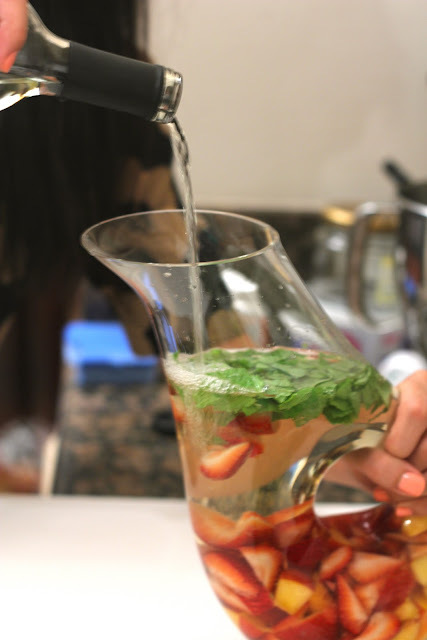 Garnish with mint and enjoy! I love sangria! Tks for sharing! Summer, is so fresh. Love strawberries. Thanks for posting the photos and feel free to drop by me too anytime.